Independent from France in 1960, Mauritania annexed the southern third of the former Spanish Sahara (now Western Sahara) in 1976, but relinquished it after three years of raids by the Polisario guerrilla front seeking independence for the territory. Maaouya Ould Sid Ahmed TAYA seized power in a coup in 1984 and ruled Mauritania with a heavy hand for more than two decades. A series of presidential elections that he held were widely seen as flawed. A bloodless coup in August 2005 deposed President TAYA and ushered in a military council that oversaw a transition to democratic rule. Independent candidate Sidi Ould Cheikh ABDALLAHI was inaugurated in April 2007 as Mauritania's first freely and fairly elected president. His term ended prematurely in August 2008 when a military junta deposed him and ushered in a military council government. Meanwhile, the country continues to experience ethnic tensions among its black population (Afro-Mauritanians) and White and Black Moor (Arab-Berber) communities. 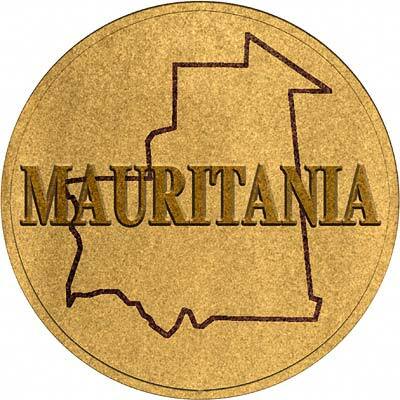 For silver and base metal coins of the Mauritania, please look at our original Chard Coins website. We make an active market in almost all world coins, gold or otherwise, including Mauritanian gold coins. If you have any of these coins to sell, please contact us, or post them to us for appraisal and offer.